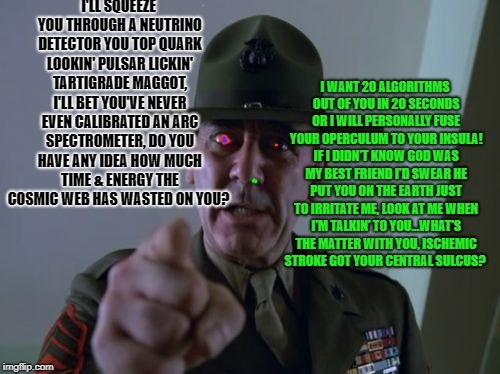 I'LL SQUEEZE YOU THROUGH A NEUTRINO DETECTOR YOU TOP QUARK LOOKIN' PULSAR LICKIN' TARTIGRADE MAGGOT, I'LL BET YOU'VE NEVER EVEN CALIBRATED AN ARC SPECTROMETER, DO YOU HAVE ANY IDEA HOW MUCH TIME & ENERGY THE COSMIC WEB HAS WASTED ON YOU? 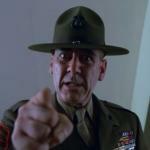 I WANT 20 ALGORITHMS OUT OF YOU IN 20 SECONDS OR I WILL PERSONALLY FUSE YOUR OPERCULUM TO YOUR INSULA! IF I DIDN'T KNOW GOD WAS MY BEST FRIEND I'D SWEAR HE PUT YOU ON THE EARTH JUST TO IRRITATE ME, LOOK AT ME WHEN I'M TALKIN' TO YOU...WHAT'S THE MATTER WITH YOU, ISCHEMIC STROKE GOT YOUR CENTRAL SULCUS?